Home » Geography » Karaites: Who Are They, and Where Do They Live? A GeoCurrents post on why Russian Jews are not Russian generated a discussion of Karaite Judaism, so now we are taking a closer look at this fascinating group. Like the Samaritans, discussed in my earlier post, the Karaites accept only the Five Books of Moses (the Torah) and the Book of Joshua, and their identity as Jews has been questioned on a number of occasions. Unlike the Samaritans, the Karaites celebrate Passover on the standard date, though their observance of the holiday is quite distinctive. Because the Karaites believe in a strictly literal interpretation of the Torah, without any adherence to the Oral Law embodied in rabbinic-talmudic tradition, the Karaite Haggadah (i.e. the text that sets forth the order of the ceremonial Passover meal) contains only verses from the Torah describing the Exodus from Egypt and the ten plagues, but none of the Talmudic discussions. Curiously, the Karaites do not refer to the holiday as “Passover” because in the Torah uses that word only to describe the sacrifice on the night before, never to refer to the seven-day festival of unleavened bread. Their strict observance means that not only leavened bread but any food or drink that has fermentation potential—wine, cheese, yogurt—is forbidden to Karaites during Passover. However, they also traditionally use pickled lemons instead of horseradish to make “bitter herbs” (maror) for the Passover plate. The roots of the Karaite Judaism go back to the so-called Heterodox Zone. Some scholars posited a connection between the Karaites as a remnant of the Sadducees, the 1st-century Jewish sect that followed the Hebrew Bible literally and rejected the Pharisees’ notion of an Oral Torah even before it was written. But most historians believe that Karaites emerged in the 8th century in Baghdad (then in the territory of the Abbasid caliphate) as a sect of followers of Anan ben David, who called themselves “Ananites”. Ben David prescribed following the Bible to the exclusion of rabbinic tradition and laws. In Hebrew, the term karaim, meaning “Readers (of the Hebrew Scriptures)”, emerged in the 9th-century works of Benjamin ben Moshe Nagavendi, who used it to describe various anti-Talmudic movements, including that of the Ananites. As a result of their denial of the Oral Torah, the Karaites differ from the followers of Rabbinical Judaism in their laws of kashrut and ritual purity, the rite of circumcision, marriage laws, rules of ritual slaughtering, their religious calendars, and the arrangement of synagogues. 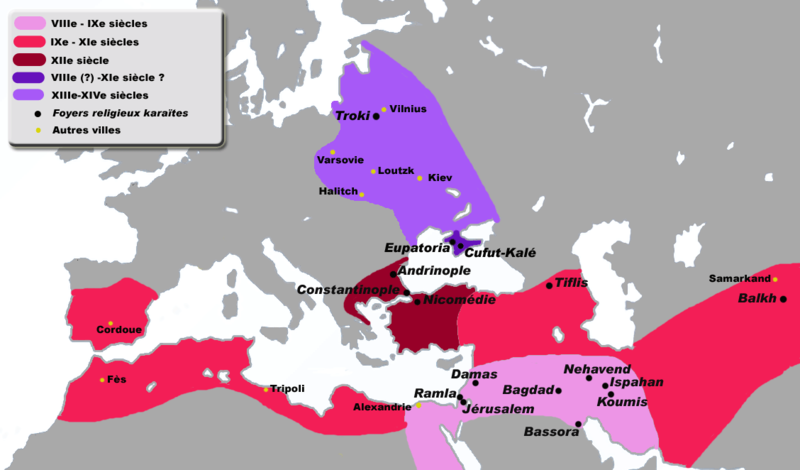 The so-called “Golden Age” of the Karaite movement lasted from the end of the 10th to the beginning of the 11th century, when the Karaite communities appeared throughout the Middle East, the Byzantine Empire (Adrianople and Constantinople), the Caucasus (Tiflis and Gagry), and Northern Africa (Cairo). According to different estimates, around 30-40% of the Jewish population at the time times followed the Karaite movement. During this period, the Karaites developed strong contacts with Muslim scientists and as a result were the first Jewish authors to write important works on Hebrew grammar. A tiny Karaite presence in Jerusalem has existed since medieval times; the Karaite synagogue is the oldest synagogue in Jerusalem. However, most of the Karaites in Israel today—numbering about 40,000— arrived from Egypt with the wave of Egyptian Jews fleeing the country in the 20th century. The largest Karaite presence in Israel is found in Ashdod and Ramle. Though they do not recognize rabbinical authorities, Israeli rabbinical authorities recognize Karaites as Jews, allowing them the Right of Return under the Israeli law. The issue of whether Karaites are Jewish is further compounded by the fact that in their community, a person’s “Jewishness” is passed along the paternal line, whereas in mainstream, Rabbinical Judaism, maternal descent is what counts. Only the Cohen and Levite status and membership in the Ashkenazic or Sephardiс groups is passed on through paternal line in Rabbinical Judaism. Although Karaites are recognized as Jews in Israel, they have not always been granted this status in other parts of the world, sometimes fortunately for them, as we shall see below. One particularly interesting group of Karaite Jews is the Crimean Karaim. They follow Karaite Judaism, yet speak a Turkic language (though they use Hebrew as their liturgical language, as well as for business correspondence, scientific works, liturgy, and tombstone epitaphs). Because of this unusual combination of religion and language, the Crimean Karaim raise the question of whether their ancestors were Jews who adopted a Turkic language, or speakers of a Turkic language who adopted Judaism. 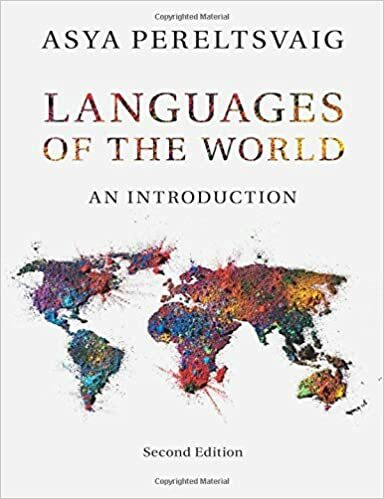 Both massive language shift and wholesale religious conversion are common features in world history. 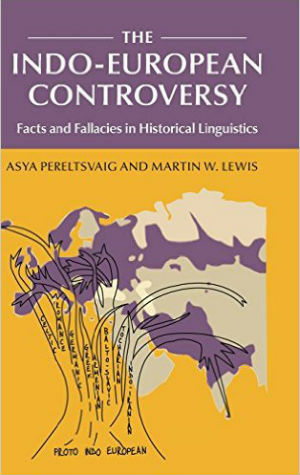 In the case of Crimean Karaim, one theory takes them to be descendants of Middle Eastern Karaite Jews who settled in Crimea and adopted a form of the Kipchak tongue. 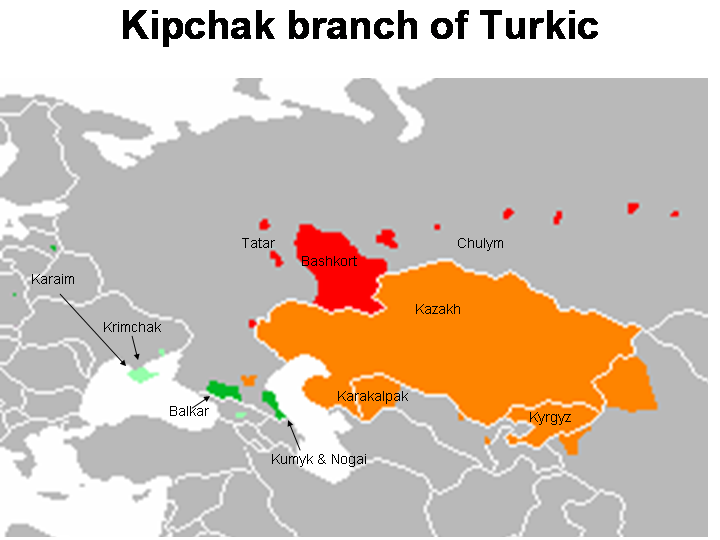 (Kipchak is a branch of Turkic languages that includes Kazakh, Karakalpak, and Kyrgyz in Central Asia, Tatar in the central Volga region, and Balkar in the northern Caucasus region.) But the language of Crimean Tatars belongs to the Oghuz rather than Kipchak branch of the Turkic family. This means that Crimean Karaim must have adopted a language of some other Turkic-speaking group. It is likely that the Crimean Karaim descended from the Jews who came into contact with the Tatar-speaking Golden Horde, picked a Turkic language from them, and then resettled in Crimea in the 13th century. This hypothesis is supported by the fact that the first written mentions of the Karaim presence in Crimea is dated 1278 and comes not from the Byzantine or Italian colonies of Crimea but from Solkhat (today’s Old Crimea), the first Tatar capital of the peninsula. Moreover, the oldest Karaim artifacts in Crimea, the earliest authentic tombstone inscriptions, were found in Kyrk-Er (now called Chufut-Kaleh); they date from the 1360s, when the Tatars captured the city. Those early tombstones contain such Tatar names as Parlak, Manush, and Tokhtamysh, meaning that the first Karaim settlers there spoke a Kipchak language. A different hypothesis takes the Crimean Karaim to be descendants of ethnic Kipchaks who converted to Karaite Judaism. One possibility is that Crimean Karaim stem from the storied Khazars, a group that converted to Judaism but most likely spoke a Turkic language—though scholars do not know what Turkic subfamily it belonged to. It is now widely believed, however, that the Khazar Khanate was multiethnic and multilingual state, with a population of not only Turkic-speakers, but also of speakers of Iranian, Finno-Ugric, Slavic, and Caucasian languages. Another reason to doubt the Khazar theory of the Crimean Karaim origins is that Khazars are most widely believed to be adherents of Rabbinical (or Talmudic) Judaism rather than Karaite Judaism. Kevin Alan Brook, the author of The Jews of Khazaria, concluded through genetic testing that the Crimean Karaim are indeed of Middle Eastern origin and hence related to other Jews. But Crimean Karaim themselves are divided as to whether they identify themselves as Jewish first and Turkic-speaking second, or vice versa. Since the 19th century, some leaders of Crimean Karaim have sought to distance themselves from a Jewish identity, emphasizing their Turkic heritage and claiming that they are “Turkic practitioners of a Mosaic religion”, separate and distinct from Judaism. Such a maneuver is possibly a response to anti-Semitic threats and repressions. In the early period after Russia’s annexation of Crimea (1783), the repressive measures of the Russian government against the Jews (“the pale”, double taxation, mandatory military service) applied to the Karaim too. However, the Karaim community sent representatives to the tsar asking to separate the Karaim from the rest of the Jewish population of the Russian Empire. Their main arguments focused on the rejection of the authority of the Talmud (which in the opinion of the Russian authorities was the main enemy of Christianity), as well as on the privileges that the Karaim had been granted by previous authorities, Lithuanian princes and Crimean khans. As a result, the Russian administration granted a number of exemptions to the Karaim but not to the Rabbinical Jews, to whom the laws were applied in all strictness. The Soviets too persecuted Crimean Karaim, many of whom were dispossessed and shot. After the Soviets recaptured Crimea from Nazi forces in 1944, the Soviet authorities counted just over 6,000 remaining Karaim. Like many other groups that survived Nazi occupation, the Crimean Karaim found themselves under the shadow of official Soviet suspicion. While they were not subject to mass deportation as a group, unlike the Crimean Tatars, Greeks, Chechens, and others, the Soviet authorities alleged that they had collaborated under the Nazi occupation, and some individual Crimean Karaim were deported. Though deriving their name from the Crimean Peninsula in Ukraine, today most Crimean Karaim live in Lithuania and Eastern Galicia (Western Ukraine) rather than in Crimea itself. These groups trace back to the original Karaite population in Crimea, some members of which resettled in Vilnius (Vilna), Trakai (Troki), and other smaller towns in Lithuania proper and in areas of modern Belarus and Ukraine that were once part of the Grand Duchy of Lithuania. The term “Crimean Karaim” is still used for this community to distinguish it from historically Aramaic-, Hebrew-, and Arabic-speaking Karaites of the Levant, Anatolia, and the Middle East. According to Crimean Karaim tradition, in 1392 Grand Duke Vytautas of the Grand Duchy of Lithuania relocated one group of the Crimean Karaim to Lithuania, where the community continued to speak its Turkic language, but developed a particular Lithuanian dialect of it. Although Lithuanian authorities typically placed all Jews—those following Rabbinical Judaism and Karaites—under the same umbrella category, Karaites in Trakai refused to comply, citing differences in faith. Tensions between followers of Rabbinical Judaism, who considered the other group as apostates, and Karaites, who felt in a subordinate position, continued throughout 16th and 17th centuries. In 1646, Trakai Rabbinical Jews were expelled from the town by Karaites request. Only in the early 18th century did representatives of the two strands of Judaism agree to mutual respect and to resolve disputes without involving non-Jewish authorities. This concord was in part a result of the persecutions that both communities suffered in the 17th century during the Chmielnicki Uprising of 1648 and the wars between Russia and Poland in 1654-1667, when many towns were plundered and burnt, including Trakai. Catholic missionaries made serious attempts to convert the local Karaims to Christianity, but were ultimately unsuccessful. Today, Crimean Karaim communities still exist in Lithuania (where they live mostly in Panevėžys and Trakai regions), Ukraine, Belarus, Poland, and Russia, though they are rapidly shrinking due to both assimilation and emigration. The 1979 Soviet census showed 3,300 Karaim, but the latest Russian census showed only 366 Karaites, more than half of them in Moscow and St. Petersburg. The 2002 Ukrainian census listed 834 Karaim in the country, most of them in Crimean cities such as Yevpatoria, Simferopol, Feodosia, Sevastopol, Yalta, and Bakhchisaray, formerly the capital of the Crimean Khanate. In Lithuania, not many Karaim remain either. The 1997 survey listed only 257 Karaim, 32 of which were children under 16. The largest Karaite community in the U.S. (though mostly of Egyptian rather than Crimean Karaim origin) resides not far from my homebase, in Daly City, California. According to the Wikipedia, the Congregation B’nai Israel in Daly City is the only Karaite synagogue in the United States.